From the Publisher: It is 2246, ten years prior to the “Battle at the Binary Stars,” and an aggressive contagion is ravaging the food supplies of the remote Federation colony Tarsus IV and the eight thousand people who call it home. Distress signals have been sent, but any meaningful assistance is weeks away. Lieutenant Commander Gabriel Lorca and a small team assigned to a Starfleet monitoring outpost are caught up in the escalating crisis, and bear witness as the colony’s governor, Adrian Kodos, employs an unimaginable solution in order to prevent mass starvation. While awaiting transfer to her next assignment, Commander Philippa Georgiou is tasked with leading to Tarsus IV a small, hastily assembled group of first responders. It’s hoped this advance party can help stabilize the situation until more aid arrives, but Gerogiou and her team discover that they’re too late – Governor Kodos has already implemented his heinous strategy for extending the colony’s besieged food stores and safeguarding the community’s long-term survival. Sidebar: I expect this trend to continue in future Discovery novels. Unlike other incarnations of Star Trek, with very episodic storytelling, readers could easily imagine slotting a story in between the adventures we saw on screen. 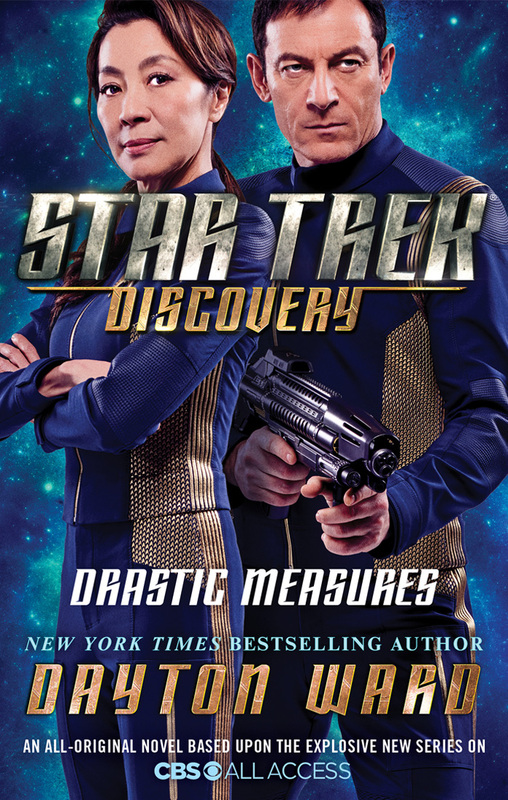 Because of Discovery‘s serialized storytelling – unless we start getting concurrent, lower-decks-style novels – I would wager that we’ll be getting more novels about out characters’ pasts. Back to the book: Ward, like Mack, worked with the DSC writers’ room (specifically with Kirsten Beyer, as noted in the Acknowledgements) while working on this novel, especially regarding canon and continuity. Once again, this story serves to tie our new characters to the existing Star Trek timeline(s) – most notably the Original Series and Enterprise, but there are even some things that bring to mind TNG canon (such as a brief mention of the colony on Arvada III and the introduction of the Betazoids). Because this novel is based on the short but brutal reign of Kodos the Executioner – as we first learned about in the TOS episode “The Conscience of the King” – many readers will already know significant details of the story and there’s a lot that could trip up canon. That can’t be easy for a novelist (especially when writing tie-ins for a franchise with notoriously nitpicky fans), and Ward does a great job with it. While I don’t think it’s necessary to re-watch the episode before you pick up the book (I did my re-watch when I hit the halfway point in the novel), it helped me appreciate it even more. The novel, of course, deals with the aftermath of the massacre on Tarsus IV, during which Governor Kodos ordered half the population of the colony to be killed – four thousand individuals whom he determined unfit or unworthy, according to his own personal metric. We know a lot of the details of what happened from the TOS episode – the famine, what Kodos did, the mistakes that were made, and that he was presumed dead – and that allows Ward to make this a character-driven story for Lorca, Georgiou, and even Kodos. We see both Lorca, stationed at a Federation research outpost on Tarsus IV; and Georgiou, leading the first Starfleet team to respond to the crisis; turn inward and consider their own ethics and principles, as well as those of the organization they serve, as they watch the colonists and government around them on Tarsus IV, which is operating under martial law for a good portion of the novel. How these characters react to this brutal execution, Starfleet’s initial relief efforts, and the hunt to track down those involved in the horrific decision helps to give us insight to the characters we will know on screen ten years later. Yes, this is Prime Lorca and Prime Georgiou, but living through such an atrocity can help us see how a different set of initial conditions or even a slightly different outcome or reaction to a given situation could mold these characters into their Mirror Universe counterparts – perhaps it’s all in what you choose to focus on hold on to. Additionally, we are able to explore Kodos’s reasoning and even entertain the idea that, the way he saw it, he truly had no other choice if he wanted the colony on Tarsus IV to survive at all. We learn about his aides and followers who were firmly behind him, of the individuals in the government who weren’t fully on board but leaned into the “better them than me” attitude, the people who ignored what was happening because it wasn’t happening to them, and those whose lives were torn apart. It forces us to think about what is is to be responsible, what is it to be complicit, and how to weigh self-preservation against the good a community. These are all important things to ponder, especially given the current state of political upheaval and uncertainty that many of us are living in. “Drastic Measures” will be published on February 6, 2018 with an MSRP of $16.00 US. It is available in large format paperback on Amazon, or at your local retailer. Ebook and audiobook formats are also available. Terrific job. So highly enjoyable. I was pretty riveted. Also so nice to feel “satisfied” by a novel. Sometimes they are a good story and enjoyable but I don’t feel satiated by them. This was a very rich story I thought. I thought this was one of the best Star Trek books period that I’ve read. The device used to tie it together with “The 4000” really made it seem real. I want more of the early adventures of Lorca and Georgiou. (Since it’s probably the only waybwe’ll Get to see them now 🙁 they are fascinating and rich characters. This book really nailed it. I listened through Scribd and the narrated version is excellent. He really projected the personalities I thought. Clear and involving. I was really surprised by the level of “this feels real” sensation I got. Not just “reading a story” feel.